One of the great achievements of the twentieth century was making retirement a real option for many working families. Thanks to private pensions for millions of workers and public programs such as Social Security and Medicare, middle-class families have been able to afford a relatively comfortable standard of living in retirement. This retirement security, however, is being eroded from a number of sides. The decimation of retirement savings due to a sharp stock market decline, historically low interest rates, and, in some cases, corporate fraud, has reduced household savings. In addition to these factors, retirement income security has also been undermined by rising health care costs. Specifically, health insurance has become more costly at the same time that costs for medical care have skyrocketed. Access to affordable health insurance is crucial for maintaining the retirement income security of many retirees. In examining four groups of people age 55 and older—near-elderly employees (people between the ages of 55 and 64 who are still in the workforce); near-elderly retirees (those between 55 and 64 who have retired from the workforce); elderly employees (people 65 and older who are still in the workforce); and elderly retirees (those age 65 and older who have retired)—some trends in health coverage for these groups begin to emerge. People age 55 and older are disproportionate users of health care because they have more frequent and more severe health problems than younger, healthier people. Deteriorating health is often a powerful incentive for older workers to retire. However, in recent decades, health care costs have risen two to three times faster than inflation. Inadequate health insurance coverage puts working families at risk of going without the health care they need in retirement. Prescription drug coverage is declining for most of the 55-and-over population, and the gap between health insurance and prescription drug coverage increases with age and retirement. Because early retirees do not qualify for Medicare, and because Medicare does not include certain benefits such as prescription drugs, many retirees must turn to private health insurance. Although private health insurance can be accessed either through an employer or by purchasing a non-group plan in the private market, the latter option is likely to be prohibitively expensive or simply not available. 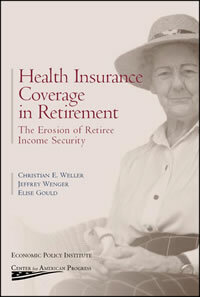 This leaves retirees to a large degree dependent on their former employers offering retiree health insurance. The share of retirees 55 and older who had part or all of their prescription drugs covered by insurance declined systematically and substantially from 1996 to 2000. The evidence suggests that older workers may stay in the labor force longer in order to maintain prescription drug coverage. Fewer employers are offering retiree health insurance. Firms are reducing access to retiree health care because employers are looking to limit rising health care costs. In 1988, 66% of large firms (those with more than 200 employees) offered health coverage to retirees, compared to 34% in 2002. Among small firms with less than 200 employees, only 5% offered employer-sponsored health insurance (ESI) in 2002. Declining access to ESI for retirees has already caused a drop in health insurance coverage, and this trend is likely to continue. From 1996 to 2002, ESI coverage for men who retired prior to age 65 declined from 51.3% to 47.8%. ESI coverage for Medicare-eligible retirees also declined slightly from 1996 to 2002, particularly for 65- to 74-year olds, which suggests that fewer elderly retirees will have supplemental ESI coverage in the future. Christian Weller is a Senior Economist at the Center for American Progress, where he specializes in Social Security and retirement income, macroeconomics, the Federal Reserve, and international finance. Prior to joining American Progress, he was on the research staff at the Economic Policy Institute, where he remains a research associate. Dr. Weller has also worked at the Center for European Integration Studies at the University of Bonn, Germany, in the Department of Public Policy of the AFL-CIO in Washington, D.C., and in universal banking in Germany, Belgium, and Poland. His writings have appeared in publications ranging from The Cambridge Journal of Economics, The Journal of Policy Analysis and Management, The International Review of Applied Economics, The Journal of Development Studies, and The Journal of International Business Studies to The Atlanta Journal-Constitution, USA Today, Detroit News, Challenge, and The American Prospect. Dr. Weller is often cited in the press and he has been a frequent guest on news programs on ABC, NBC, CNN, MSNBC, CNBC, Fox News and Bloomberg Television. Dr. Weller holds a Ph.D. in economics from the University of Massachusetts at Amherst. lic Policy at the University of Georgia’s School of Public and International Affairs. Dr. Wenger’s research focuses on social insurance and labor markets, with particular attention paid to older workers and workers in nonstandard work arrangements. Prior to his position at the University of Georgia, Dr. Wenger worked as an economist on the research staff of the Economic Policy Institute. His most recent research on business cycles and temporary employment is forthcoming in The American Journal of Economics and Sociology. Other research has appeared in The Review of Political Economy, The Journal of Social Health, and Challenge. The Wall Street Journal, New York Times, USA Today and The Los Angeles Times have reported on his research, and he has written editorials for The Houston Chronicle, San Diego Union-Tribune and The Atlanta Journal Constitution. Dr. Wenger holds a Ph.D. in public policy analysis from the University of North Carolina, Chapel Hill. Elise Gould is an economist specializing in health and labor research at the Economic Policy Institute. Her publications include academic research on children’s health and mother’s labor supply in Health Economics, an op-ed on employment measurement for the Detroit News, an article on Bush’s health care agenda for Dollars and Sense magazine, and an encyclopedia entry on comparative national health systems for Macmillan’s Encyclopedia on Aging. Her recent research focus is on the effects of children’s health on their school readiness and achievement in later life, the interplay between income and health inequality, an examination of job quality during the current economic recovery, and metropolitan inequality over the last 30 years. Dr. Gould holds a Ph.D. in economics from the University of Wisconsin -Madison and a master’s in Public Affairs from the University of Texas at Austin.